1. Fry the chorizo and onion in a large pan for 3-4 minutes. 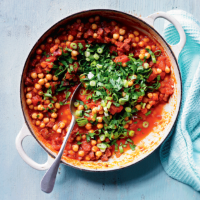 Add the chickpeas, tomatoes and 100ml water, cover and simmer for 5 minutes. 2. Stir in the salad onions and chopped parsley, season and serve.